'Bratislavan Prince' (Anton Mego, R. 2009). Seedling# AM-00/0559-9. TB, 31" (78 cm), Midseason to late bloom. Standards light orchid-lavender, huge cream-brown border; style arms lavender silver, cream brown edge; falls velvety dark blue-purple, few white lines at edge, small white area stitched purple brown near brick carrot beards; wavy; slight sweet fragrance. Seedling# AM-98/0312: ('Twilight Blaze' x 'Night Attack') X 'Slovak Prince'. 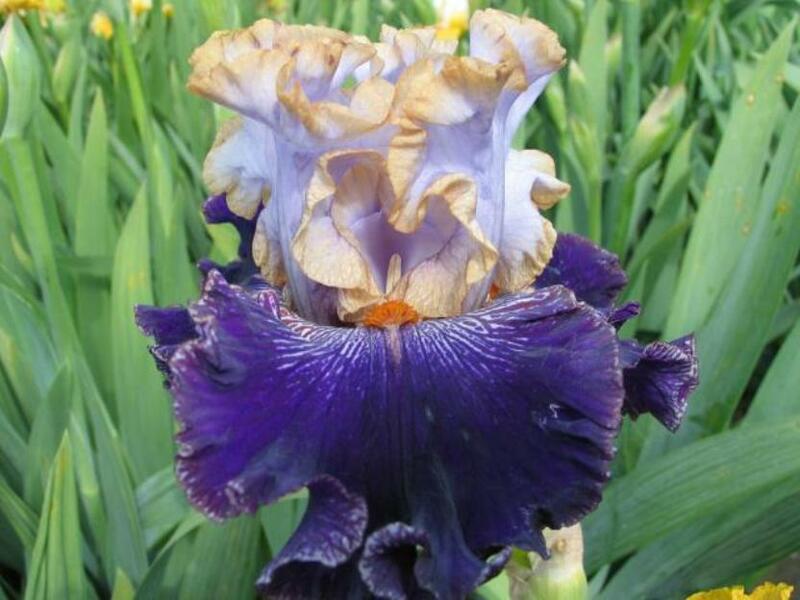 International Iris 2010. First place winner of Moscow International TB Iris Competition 2015. Hybridizer's comment: Unusual and unique advance in the "Slovak Prince pattern". Already the parent of some of the most spectacular seedlings we have ever seen! Order early --- this one has been selling like hotcakes since the website first went up!